Actual ecological research postulates for alder carrs a cyclic alternation of Alnus tree vegetation with open fen or Salix dominated vegetation. Such cycles are also indicated in palaeo-ecological studies, but normally the temporal resolution of these studies is insufficient to resolve the duration of short-term cycles in vegetation development. 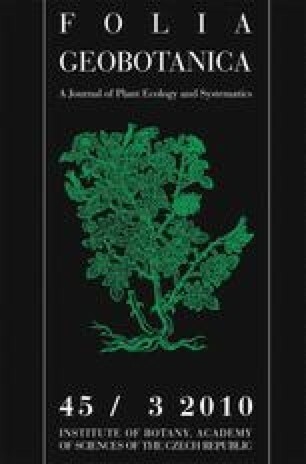 This paper presents a high resolution palaeoecological study (including pollen, macrofossils and non-pollen palynomorphs) of a Late Holocene wood peat section from the small, long-term Alnus dominated peatland ‘Heger Soll’ in the ‘Rodder Forst’ in Western Pomerania (NE Germany) to reconstruct short-term vegetation changes. During a time-span of ca. 800 years, sedge-dominated fen vegetation types alternated with two phases of Alnus carr and one phase of Salix shrubland. The alder carr decline coincided with the beginning of intensified human activity in the surroundings of the mire and was probably connected to increased water discharge resulting from large-scale deforestation, after which willow scrub and sedge fen became established. Growth of Alnus trees was associated with prolonged phases of reduced human impact and probably less water supply. This study shows that human impact on the uplands surrounding the mire and on the alder carr itself may explain the observed “cyclic” vegetation development of alder carrs, willow scrubs and sedge fens in Central Europe. The online version of this article (doi: 10.1007/s12224-010-9063-8) contains supplementary material, which is available to authorized users. This research was carried out as a MSc-study of D.G. at Greifswald University in connection to the “ALNUS”-project funded by the Deutsche Bundesstiftung Umwelt. The 14C-dates were provided by the Poznań Radiocarbon Laboratory (headed by Tomasz Goslar) and the Leibniz-Laboratory for Radiometric Dating and Stable Isotope Research in Kiel (headed by Pieter Grootes). We thank John Couwenberg for his help in sampling core ROF and for calculating the ages of zone boundaries (pollen density dating), Erika Retzlaff for preparing the pollen samples, Almut Spangenberg for assistance in identifying microfossils, and Dierk Michaelis for help with the identification of macrofossils.